Cover: Rudy Nappi, a rough night on the bay, Frank and Joe providing classic bright red and yellow contrasts to the dark sky and water. Setting: Bayport again! My, still lots of crooks in this town. Where’s Fenton This Time? : Bayport again, but busy working on his case (would you believe it intersects with the boys’ case?) so he is mostly out of the picture. Which Chums Show Up? : Chet, Callie, Iola, Tony, Biff, Jerry — Hey, they’re in the title, so they might as well show up. Aunt Gertrude’s Dessert: Nothing! They eat, but Gertrude doesn’t make them anything. What was she thinking? Plot: Bank robbers, costume parties, mistaken identities, hermits, shantytown dwellers. 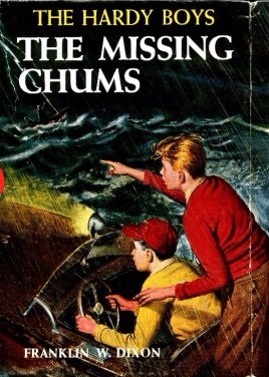 Chet and Biff get kidnapped, and thus the title. Review: Pretty good. A serious situation with their best friends getting kidnapped, and this leads to some very good detective work. A more realistic tale. This story moves nicely.